Canon is consistently among one of the most watched participants of the biennial Photokina imaging and photography fair – a six day event currently underway – hosted in the German city of Cologne. And on Monday, Canon did not disappoint Photokina attendees with the announcement of three new PowerShots, including the S110, SX50 H S, and the G15. 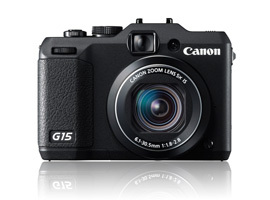 The latter replaces the popular and high-end two-year-old PowerShot G12. The 12.1-megapixel G15 makes a number of changes from its 10-megapixel predecessor. On the outside, the most noticeable physical transformation is its scaled-down size: weighing 352 grams and measuring 107 x 76 x 40mm (versus 355 grams and 112 x 76 x 48mm), the G15 is definitely slimmer than the G12, but still an uncomfortable fit in any jean pocket. Aesthetically, the G15 retains many of the cosmetics of its older sibling. However, it trades in a built-in flash for a pop-up; and its once articulating LCD screen is now fixed. Although, this screen is bigger in size and resolution, measuring 3-inches and bursting with superb image quality in its 922k-dot display (compared to 2.8-inches and 461k-dot). The PowerShot G15 further impresses with its refreshed optics. Its lens’ optical zoom measures 28-140mm and its aperture is a bright f/1.8-2.8 – hopefully this will aid the G15 in its low light performance, as the G12 struggled in the dark with its aperture of f/2.8-4.5. • Its DIGIC 5 image processor that assists the camera at its continuous shooting rate of 2 fps. • An external exposure value dial. • Photo effects like sepia and black and white color alteration. • Full HD 1920 x 1080 video at 24 frames per second. • Can film creating a miniature effect.